The floathouse-shell is a versatile structure that can be used in multiple ways. All of our configurations are based on building this structure first, then adapting it into the other styles. If someone desires a use we have not thought of, we offer the floathouse-shell ready to be adapted to any use you can think of. The floathouse-shell could excel as a simple and cost-effective way to do things at sea that don’t involve habitation, like storing materials and equipment at sea. Combined with the special properties of our Geopolymer concrete, it can reside in the ocean environment with minimal to no maintenance for more then a hundred years. Basically, you can buy this shell and finish it any way you want, for any purpose you can think of. Large-displacement float (1.4 million lbs). The structure is built using a filament-winding process, reinforced with multiple layers of geopolymer cement, then internally reinforced with cast-concrete ribs. This structure has openings on both ends in the form of steel rings. This structure can be provided with or without a floor to separate the top and bottom sections, and optional keel weight poured in place as the bottom floor, at additional cost. 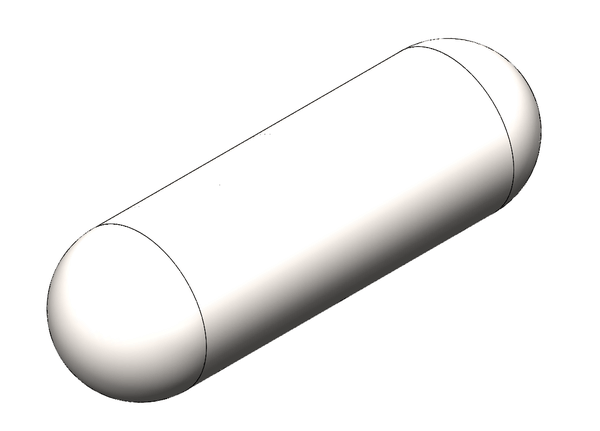 One major limitation on a solo-shell like this is that it is vulnerable to rolling, it has no stabilizing support–it would therefore not be usable to live in, or for storing sensitive items vulnerable to damage. Q: Can I order a longer or shorter version, or a different diameter? A: We plan to produce versions with different dimensions. Contact us for the latest status update on this.